Jeff Cox takes an early crack at projecting Hockey East for the 2018-19 season. He has Providence in the top spot, followed by BC, BU and Northeastern. Last Word on Hockey profiled 2018 recruit Joel Farabee for the upcoming NHL Entry Draft. The left shot forward, who has 64 points this season for the NTDP U18s, has been ranked #8 by HockeyProspects, #12 by McKeen’s and #16 by Future Considerations and ISS. The U18s will look to repeat as World U18 Champions beginning April 19 in Magnitogorsk, Russia. NHL Network will air all Team USA games. Through four days of the USA Hockey Tier 1 18U Championships, 2018 recruit Dominic Vidoli is tied for the tournament points lead with nine and tied for the assists lead with seven. Vidoli helped lead Culver Military to three straight wins in pool play before it was eliminated by the Eastern Mass Senators in the Quarterfinals. 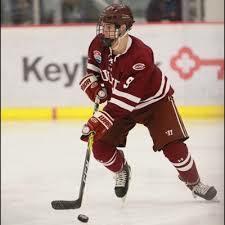 With a 40-3-1 record, Culver was among the top-rated U18 programs in the U.S.
2020 recruit Josh Lawrence, playing in the 16U tournament, had a goal and two assists for CCYHA, which also was eliminated in the quarterfinals. A pair of 2020 recruits, forwards Dylan Peterson and Luke Tuch were late-round picks in Saturday’s OHL Priority Draft. Peterson (#126) and Tuch (#257) had recently received invitations to join the 2018-19 NTDP U17s. A third 2020 recruit, defenseman Donovan Sebrango, was a second-round pick (#40) of the Kitchener Rangers. Clayton Keller has been named Team MVP of the Arizona Coyotes. With a 23-42-65 scoring line, he also led the club in scoring. Keller won the NHL’s Rookie of the Month award twice. Despite missing 15 games this season, Jack Eichel led the Sabres in scoring with a career-best 64 points. The former BU All-American met with the media discussing his frustration with Buffalo's lack of progress and his continued commitment to the team. Evan Rodrigues finished with 25 points in 48 games.